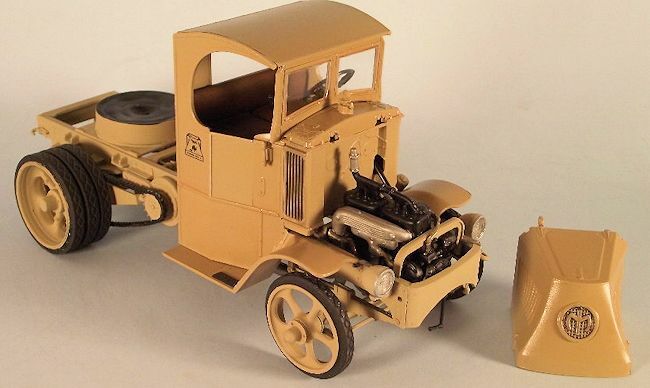 NOTES: Resin triple rear wheels and headlights from Industrial Model Design by Richard Mark were added. Mack Trucks, Inc. is an American truck manufacturing company and a former manufacturer of buses and trolley buses. 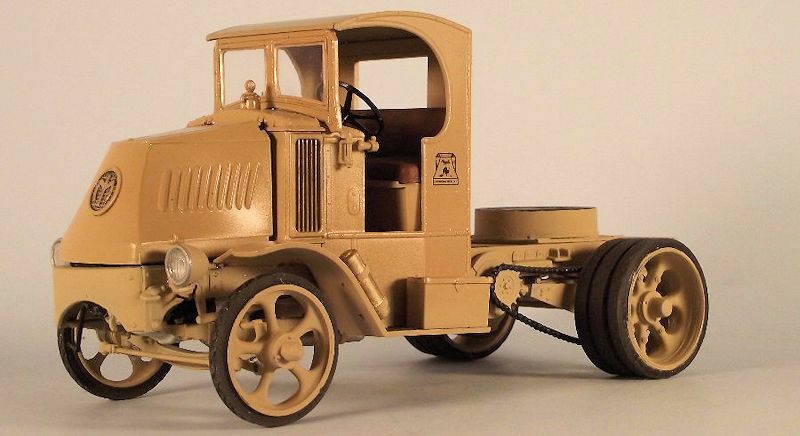 Founded in 1900 as the Mack Brothers Company, it manufactured its first truck in 1907 and adopted its present name in 1922. 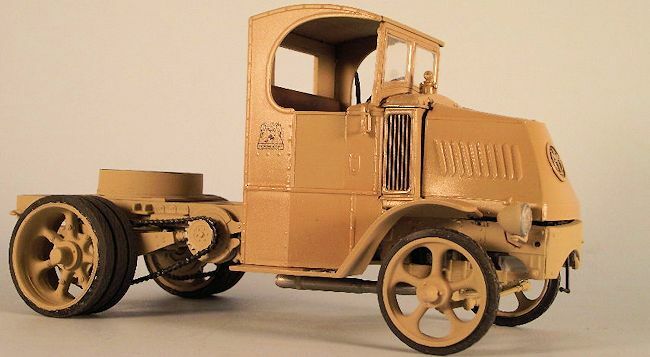 In 1916 Alfred Masury designed the AC model with the informal name "Bulldog", which, rumor has it, was given for its massive tapered hood, low silhouette and widely spaced wheels and ability to work in the toughest conditions. In-line 4 cylinder engine with an output of 75 hp was located directly above the front axle. The radiator was placed in front of the driver's seat and cooled by air flow from the impeller, mounted in the flywheel. The four-speed gearbox was placed in the middle of the chassis and combined with the main gear and differential. The truck had chain drive. Options included things like roof, head lights, tail lights and windshield. 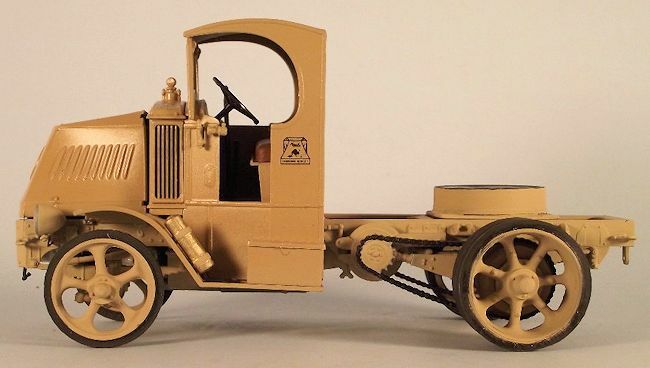 A lot of people believed these trucks didn't have doors, but the doors dropped straight down and were often left open for convenience of entry and to help cool the cab since the radiator was part of the firewall. Another rumor is that the radiator was located on the firewall because in the cities, trucks scared horses and when the horse kicked around the front of a truck the radiator was often a casualty. Interesting thought! 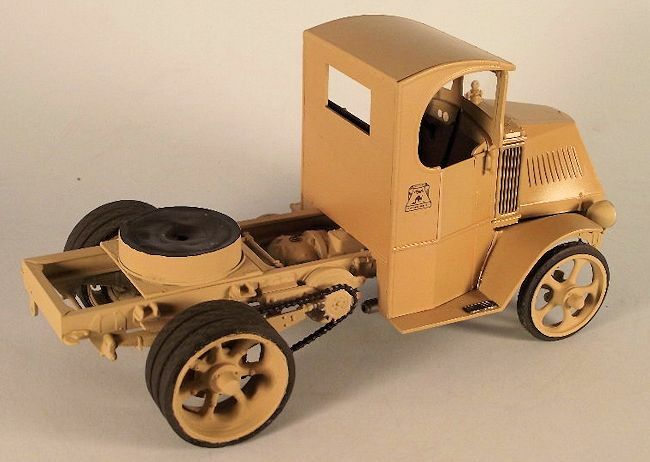 This kit started life as the older issue 1/24 1926 Monogram Log Hauler truck. It is a nice kit molded in bright red. The parts fit well and are well engineered for assembly. The parts are flash free with the sprue attachment points well thought out. The multi-piece cab fits well with the panel lines and multi-part cab piece lines being the same. No filler is required as there would be a panel seam on the real cab. The instructions were very good. The assembly was presented in a straight forward and logical manner with big drawings. The part I really liked was that the instructions pointed out things like the roof was optional and showed where to cut it to get rid of it. I was told the roofless cab was referred to as a Bermuda cab. There is only one decal option for the Columbia Lumber Company and Mack Truck Company. The decals are thin and apply very well, just take care you don't rip them. I dug this log truck out of the stash, but I wanted something different. I was originally thinking of doing a U.S. Army truck. 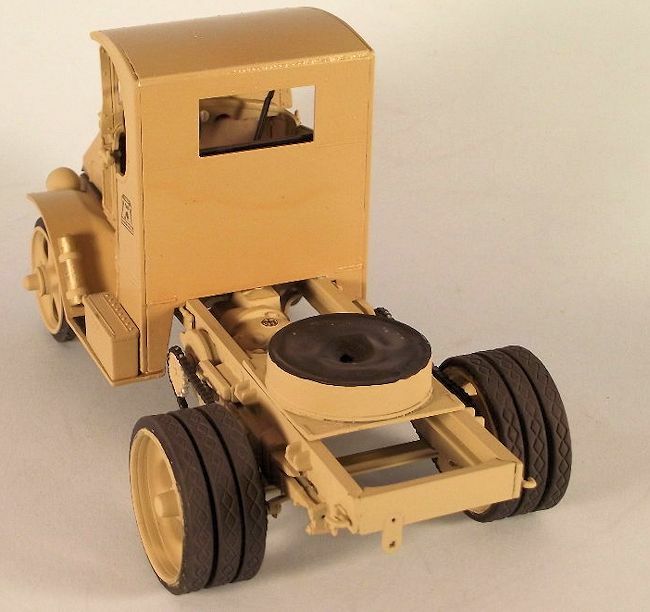 After browsing the web I decided to make an early Mack tractor. I started this conversion by cutting about 1 1/4 inches out of each frame rail to get the proper wheel base (122 inches wheel hub to wheel hub). Next I assembled the frame without the engine, along with all of the running gear (except the rear wheels) and head lights. You must take care to get things squared up. If you don't, this kit will be a nightmare later on. While the glue dried on the frame, I built and painted the engine. It is pretty simple, but with a little detail painting, it really looks the part. The instructions want you to install the engine in the frame as you built it up, since the engine mounts form part of the frame's cross braces. I didn't install it until after painting the frame. Everything was given several thin coats of Krylon grey primer. It covered the red plastic well with no bleed through. The resin wheels/tires were washed and painted at the same time. After primer had dried for 48 hours I sprayed everything a flat Krylon tan. I wanted to have this Mack look like it had light use, so I left the chassis and wheels in flat. The cab and hood were given a couple of thin coats of Krylon gloss. I like the effect. Since the doors on the Mack AC dropped straight down, I figured the paint would have weathered differently not being exposed to the sun light, so the door just got one coat of gloss. The rear wheels/tires are one piece, so I masked the wheels and sprayed the tires Krylon primer black. The front tires are black rubber and just slip onto the wheel. Since they didn't match the rear for color, I painted the front tires, too. The Krylon primer dried on the rubber with no problem. The radiator and hood screen were given a couple washes of my flat black wash solution. The chain was brush painted flat black and the teeth on the gears were given a little steel paint on the tips to show wear. The seat was brush painted leather with a flat black wash. The only decals I used were the Mack truck decals. They are thin and only required about 5 seconds soaking time in the water. I slipped them into place on a drop of Micro Set. They snuggled down with no sheen or silvering. The Micro Set is probably not needed, but I use it out of habit. Hint for painting the chrome headlight bezel on this type of headlight: shake your chrome silver paint really well-take off the cap and place it paint side up on a flat surface-drop the headlight bezel open end first into the paint lid-lift it straight out and you will have a perfect silver ring around the opening. Shake, drop and repeat for the other light. Time for final assembly. I fit the motor into place, with a little choice language. Hint: don't put any glue on the mounts until you get everything in place, you will smear it all over. I just put a couple of drops of thin superglue on the mounts and they are holding just fine. I glued the interior into the cab and the cab assembly to the chassis. Trying to fit the hood was a test of patience. I lost. I had to take the cab off of the chassis, remove the mounting supports and make new cab mounts and paint them. This was all my fault, not the kit. I cut the frame under the cab and forg ot to allow for the change. The glass was glued in the windshield frame with Elmers glue and the assembly was just snapped into place. It holds right where it is supposed to. The resin headlights were painted silver inside and the lenses from the kit headlights fit right into them. A black wire was run to each headlight to simulate the wiring. Since the hood was not perfect and I had sacrificed one tow hook to the carpet monster; I glued the right headlight and bracket on slightly askew. Minor truck damage from a careless driver. I dry brushed a little steel paint in the area to show a paint scrape. It is too light to show in the picture. Strangely enough the wheels were the last to go on. That included the fixed table fifth wheel. (You could also model a Martin rocking table fifth wheel.) My fifth wheel is built from the bottom of a round pill bottle set on a base of sheet plastic with some thin plastic strips to add more detail. Since the bottom of the pill bottle had a raised edge and writing I just filled it in with a couple layers of Elmers glue, then painted it flat black. There is a thin coat of grease on it. I used Vaseline petroleum jelly over the flat black for grease. A friend just had to touch it because it looked like grease. Imagine his surprise to get a greasy finger! This was a simple conversion using a good Monogram kit as a basis. The kit's dual wheels would work just fine without using resin triples. The resin headlight conversion was just because I wanted to do it, the kit lights would be just fine. You don't have to waste the truck bed. It would be a good start for the trailer. I plan to build a Bermuda cab, with no roof or windshield and the kit headlights. It will probably have dual wheels and a Martin rocking table fifth wheel. This is a good kit worth building and modifying. Reference: Mack drawings were supplied by a good friend. The fifth wheel assembly was copied from early patent drawings for a non-rocking, fixed table fifth wheel.